Welcome to the Stauffer Lab in the Department of Biology at University of Louisiana at Lafayette. Our research focuses on phytoplankton ecology, biological oceanography, and water quality issues in freshwater and marine ecosystems. The RAPID Plankton group presenting at ASLO Aquatic Sciences Meeting in San Juan, Puerto Rico. April 2019: It's been a busy 2019 in the Stauffer Lab! 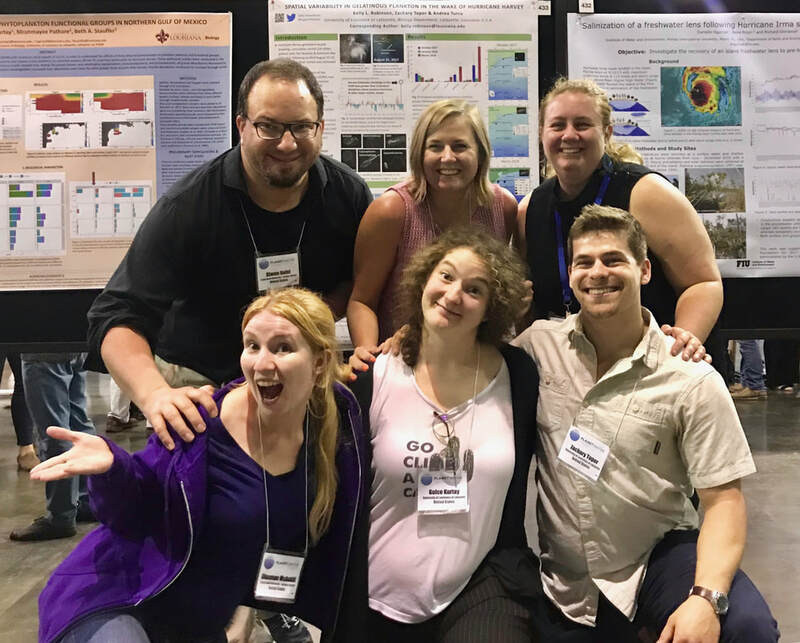 Beth and Gulce Kurtay presented their Hurricane Harvey research at the ASLO Aquatic Sciences Meeting in San Juan, Puerto Rico. Former M.S. student Jaylyn Babitch submitted a manuscript based on her thesis research for publication. And we welcomed a new lab member, Jen Raabe, as Research Technician working on our ACT Gulf of Mexico Nutrient Sensor Pilot Project with partners around the Gulf. Here's to another productive few months ahead! Summer 2018: It's been a busy summer! Masters student Jaylyn Babitch defended her thesis and we hosted our first summer of the Healthy Streams, Health Coasts REU program. Two students, Tallie Foster and Rachel Humes, did their research with our lab, and nineteen students in total presented posters of their summer research at a symposium in late July!